Containerization is an operating system virtualization technology to provide a lightweight virtual environment that isolates and encapsulates a set of computing resources like CPU, memory as well as application components like application code and dependencies. Each container serves as as individual package which is capable to execute an application or services regardless of the what the underlying computing environment is. One of the most common challenges developers faces is that when they move an app from testing environment to production environment, they may find the same application can’t be executed smoothly due to numerous reasons like different OS, different configurations, etc. With containers, the application can be executed the same no matter what the underlying platform is. The portability gives smooth transition from testing to production environment, from local desktop to Cloud, from one cloud to another. A container usually takes up much less computing resources like CPU and ram compare to a virtual machine, allowing more containers (containing application or services) running at the same server or instances compare to VMs, thus increasing the utilization of computing resources. Also, container has faster boot times compare to VMs which gives faster creation, termination and scaling of applications, and thus give better application operational efficiency. 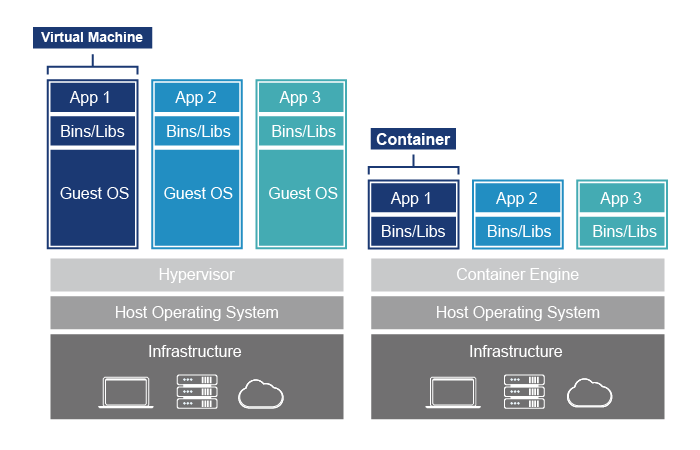 By containerizing applications, it standardizes across various environment and fasten the development and release cycle by eliminating environmental inconsistencies. Developers can focus on debugging the application instead of checking the environment. Microservices is a software development technique that structures an application as a collection of loosely coupled services. The microservice architecture enables the continuous delivery or deployment of large, complex applications. It also enables an organization to evolve its technology stack.